Since the end of the 20th century, we have been witnessing a massive loss of honeybee colonies throughout the world. This phenomenon, referred to as Colony Collapse Disorder, is caused by multiple factors including poor nutrition, pesticides, or infections by pathogens. One type of pathogens are microsporidia, especially Nosema ceranae (1). Microsporidia are eukaryotic unicellular organisms and obligate intracellular parasites that are phylogenetically located at the basis of the fungal tree (2). Another peculiarity of the microsporidia is their highly reduced genomes, which attests to a complete adaption to their parasitic life style inside a host cell. Investigating the mechanisms of microsporidian infection/proliferation will contribute to a better understanding of one factor underlying the loss of honeybees. My Ph.D advisor, Prof. Dominique Ferrandon, started collaborating with the team of Prof. Frédéric Delbac (Clermont-Auvergne University, France) that is working on the infection of honeybees by Nosema ceranae and the impact of exposure to sublethal levels of pesticides (3). As the biology of theses parasites remains poorly known for lack of genetically-amenable models of infection, excepted for the nematode Caenorhabditis elegans, we decided to use the model organism Drosophila melanogaster and its cognate microsporidium Tubulinosema ratisbonensis to apprehend microsporidiosis. To study the infection of the parasite, Dr. Sebastian Niehus developed a simple injection model that recapitulates the natural infestation by Tubulinosema. As T. ratisbonensis-infected flies displayed clearly reduced egg-laying rates, we supplemented our usual medium with more yeast. Unexpectedly, infected flies died faster than control, a phenotype correlating with an increased parasitic load. From this simple observation, we decided to investigate which metabolite was limiting parasite proliferation. Surprisingly, microsporidia proliferation was not critically dependent on amino acids, carbohydrate, or cholesterol supplementation in the food. The major fuel for parasite proliferation are the lipids. Our experiments demonstrate that supplementing the fly diet with fatty acids amplified the virulence and the load of the parasite. In parallel, we observed that T. ratisbonensis proliferate preferentially in the fat body of the Drosophila host lobules, an insect tissue with mixed characteristics of the mammalian liver and adipose tissue. We also noticed a correlation between parasite proliferation and lipid droplets loss in fat body cells (Figure 1). Figure 1: T.ratisbonensis proliferates preferentially in the fat body at the expense of host lipid reserves. Drosophila fixed and stained for DNA (DAPI, blue), for actin (FITC, green), for lipid droplets (Nile Red, red), and for T. ratisbonensis spores (Cy5, yellow). Left, Uninfected abdomen; the blue signal originates from the cross-reaction of DAPI with the tracheal system (°: air sacs); the dorsal vessel appears green (outlined); fat body lobules are stained in red. Right, Infected abdomen at 9d post infection; the blue signal corresponds essentially to the nuclei of the proliferating meronts. Spores differentiate at the cortex of the hypertrophied fat body lobules (asterisks) as well as pericardial cells, which line the dorsal vessel (outlined). Thus, I, with the help of Gaëtan Caravello, decided to embark on a small-targeted screen on some 100 genes involved in lipid metabolism, with a special emphasis on those involved in fatty acid synthesis or degradation. Conversely, any gene coding an enzyme that uses up a metabolite critically required for parasite proliferation would yield the opposite phenotype. This mapping strategy allowed us to identify phosphatidic acid as a key metabolite. Interestingly, when Gaëtan Caravello injected phosphatidic acid into the flies, the parasite proliferated more intensely and the flies succumbed earlier to the infection (Figure 2). Figure 2: Phosphatidic acid is a compound scavenged by T. ratisbonensis that limits its proliferation. Simplified scheme of the synthesis of fatty acids and downstream metabolites used for storage or synthesis of membrane phospholipids. All of the enzymes shown in this scheme have been tested by the RNA interference approach: down-regulating their expression led either to an improved host survival to T. ratisbonensis challenge and a decreased parasite load (green area) or the opposite phenotype (red area). In the latter case, the decreased expression of these enzymes that use up phosphatidic acid is expected to increase the availability of this compound for the parasite. 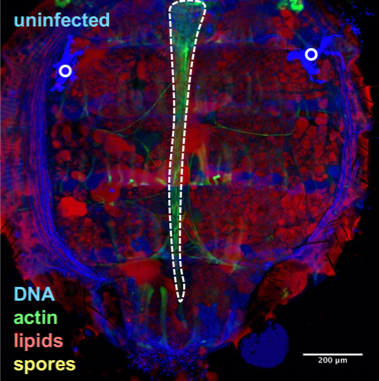 To conclude, the use of a novel genetic approach to understanding microsporidia-host interactions sheds a new light on the critical requirements at the metabolic level of this parasite that cannot yet be genetically-manipulated. In the case of microsporidiosis, fat starvation is likely to help the host, a finding that may be relevant to limit the severity of this type of infection in honey bees.